Stella Vision for JAVA is generic name of the following 3 softwares. Fine Vision for JAVA：It's specialized in editing of fine pattern and various functions of wet-etching. It's possible to treat an excellent extraction treatment of outline, off-set treatment involved internal and external automatic judgment, identification choice specific data easily by multiple figure choice commands. Also, it's possible to treat adept editing process treatment by logic arithmetic processing of connecting figure to each other, co-treat delicate wet-etching processes by input power of parameters. In addition, it's possible to perform the corrections wet-etching treatment which off-set linearly in response to forms with keeping minimum pitch. Router Vision for JAVA：It's a suitable software for substrate cutting and forming path of hole making. Router Vision for JAVA：It's a suitable software for substrate cutting and forming path of hole making. It forms a NC program for router processing machine automatically or semi-automatically based on information from CAD data (for example, Gerber format, DXF, and etc.). It's possible to adjust treat drawing and error which are abbreviated in drawing operation. Also, it's possible to draw up way-out rout for router by multiple functions which are layout function of drill-bit and fabrication function of cutting into fabrication of rout according as width and configuration of slit-pattern in original figure data, rout fabrication function of grid matrix pattern, fabrication function of rout of prevention of cutter-marks, control function of moving speed, imposition treatment function, and so on. It is not constrained by any router processing machine by flexible NC code parameter. Zig Vision for JAVA is software for Zig treatment only. It sorts exchange of pad-flash, optimization of probe pin, address numbering of net-end points, round-flash on 1 map line and runs numbering. It mounts multiple functions such as automatic mapping function. It supports output of file which covers information of pin with terminal number. 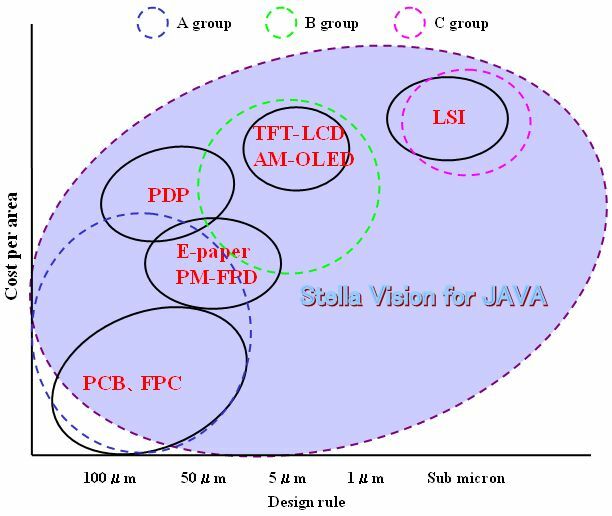 There are two features roughly in CAD/CAM software “Stella Vision for JAVA”. First of all, one is realization of ultra-high speed treatment by original algorithm. We spent on development of this algorithm for 3 years. However, the core source code (a mere A4 size paper) gained as result in this development had any more value. Upward, this algorithm became main resource of our products. For example, while we prepared an etching calibration data with mass capacity by the conventional highest data search engine, we spent on preparation for 12 hours. On the other hand, we could shortened in this preparation for only 5 min by new algorithm. Of course, data precision of this new engine is same as the conventional data search engine. This high speed ability brings in inundant superiority against Stella Vision. In fact, we heard users of Stella Vision could not use other softwares. Stella Vision upgrades by 1 time per day. In short, our engineers upgrade this software based on user's feedback information on semi-realtime. User's estimate against this speedy version up is corroborative of more than 90％ in product maintenance contract. Also, this software supports in the shape of Plug in” against each other needs. Another advantage of Stella Vision is detail and speedy version up. Figure shows relationship of design rule and cost per area, field of CAD/CAM system in main electronics device. For example, softwares of A group support PCB only, softwares of B group support AM-LCD and AM-OLED only, softwares of C group support semiconductor only. In short, supported range of these softwares is limited. On the other hand, Stella Vision supports all range as figure. This is a reason why it has absolute advantages such as high precision (16 digit), large capacity (64 bit). We will reinforce cooperation agreement with our customers, in order to correspond to required specification of costumers. 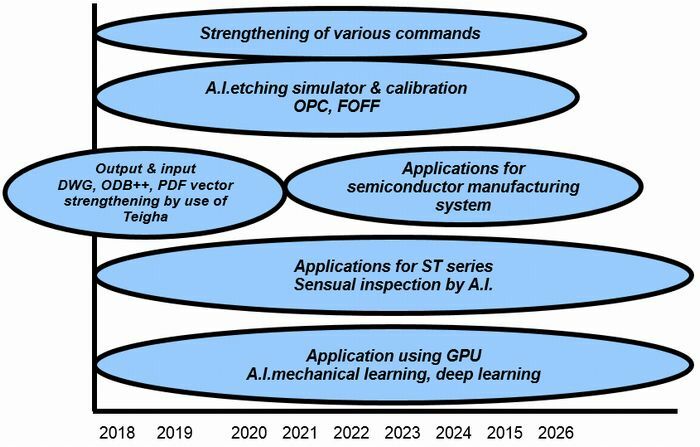 Especially, we are focusing on semiconductor, MEMS, printable electronics fields. For example, large capacity and high precision DB (Data-base) are required in the electric series CAM recently. We have developed above such DB with 64 bit and 16 digit in the past. We will improve edit function of CAM from now,too. Also, we will develop CAM software with automation and minimization of operating time of operators. For example, we enhance edit function of photograph data. As a result, we will improve design feed-back system of product inspection information by organized integration, and then, improve teaching function of inspection and measurement. We set out total productivity enhancement.